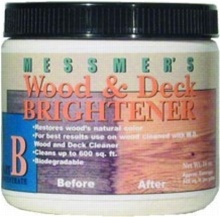 Messmer's Wood and Deck Brightener (Part A B) powder concentrates are specially formulated to brighten exterior wood decks, fences, log homes, and other exterior wood projects. 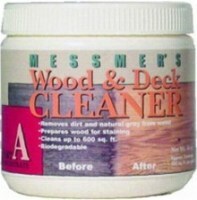 Messmer's Wood and Deck Brightener can be used to prepare old, weathered wood for finishing, or as part of regular wood care maintenance to keep your deck, fence, log home, or other wood surfaces looking great. The powder concentrates are mixed at the job site just before use, insuring the freshest cleaning and brightening solutions. 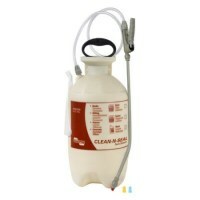 The products are available in convenient 16 oz jars which are concentrated enough to make up to five gallons of solution. You simply dissolve the powder in warm water, stir, and use according to the label directions. Use Wood and Deck Cleaner (Part A) on all woods including cedar, redwood, ipe, pine, and pressure treated lumber. For woods prone to tannin staining such as redwood and some cedars, use Wood and Deck Brightener (Part B) to lighten wood and remove stains. The Part B also works great on iron and rust stains on all woods. where it shows "temperature 45-95, does that mean the temperatures it should be applied in, or is that what temperatures the product holds up to? I live in an area that gets as cold as 0 degrees Fahrenheit in winter. Use the Messmers Part B Cleaner. What is the best way to clean algae from brazilian redwood deck that has been using messmers for hardwood.